Qatar's Al Baker will hold a press conference tomorrow (13 May) in Washington, presenting his view on the ongoing Open Skies quarrel. It is expected that the self-assured manager will pour more oil on the already flaring fire, ironically right in the lion’s den. Call it luck, coincidence or careful planning, but the acrimonious and sometimes ferocious vocal battle about subsidies, unfair competition and Open Skies, between three U.S. carriers and their three counterparts from the Gulf region could enter a decisive phase in Washington, DC this week, as some of the major players will be gathering for separate functions in the US capital. The CEO's Richard Anderson of Delta Air Lines; W. Douglas Parker of American Airlines Group and Jeff Smisek of United Airlines will attend a National Press Club (NPC) luncheon on May 15 where, according to a NPC release, they will jointly discuss the subject of “Restoring Fair Competition to the Skies" and "explore what they call unfair international competition". On the same day, World Travel Inc, organises its biennial symposium in the capital, which will include several keynote speakers and a panel on "Open Skies". This panel will explore the many public-policy issues from the viewpoints of consumers, airports, mid-size communities, cargo carriers and travel and tourism stakeholders. One of the panel members will be Rush O'Keefe, senior vice president and general counsel of FedEx Express, whose company is opposing the campaign by the three US passenger airlines, because Open Skies and fifth freedom rights are critical to FedEx' air cargo business, including its strategically located hub in Dubai. 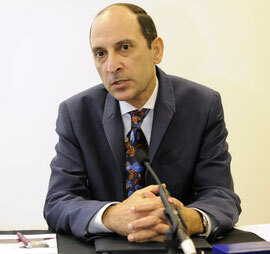 A third event on Wednesday this week is a press conference by Qatar Airways CEO, Akbar Al Baker, who is in Washington, DC, to meet with government officials and afterwards will hold a much-anticipated press briefing, where he is expected to present his view on the ongoing dispute. The Gulf carrier last week announced its first direct flights to Los Angeles, Boston and Atlanta from its Doha hub and its second daily flight to New York. Qatar Airways said it would fly Boeing 777s to Los Angeles and Atlanta, and Airbus A350s on its Boston route and for its second New York flight. All flights will offer substantial belly-hold capacity for cargo. Qatar's route expansion follows an earlier announcement by Emirates SkyCargo, the freight division of Emirates, that it will expand its US cargo network to 11 destinations, when the airline launches a daily service to Orlando, Florida, from September 1, 2015. The Dubai-Orlando route will be served by a B777-200 LR, which has a belly-hold capacity of up to 17 tonnes of cargo per flight. Emirates SkyCargo also has belly-hold cargo services to San Francisco, Seattle, Washington D.C., Boston, Dallas, New York, Los Angeles, Chicago and Houston, with the latter four cities also forming part of the air cargo carrier’s US freighter network, along with Atlanta. Al Baker speaks of "bankrupt U.S. airlines"
Delta, United and American have been pressing the U.S. government for a temporary freeze on new services to the U.S. by the three Gulf carriers. Mr Al Baker, who was speaking at the recent Arabian Travel Market in Dubai, said that U.S. airlines were “all bankrupt” and that he wouldn't "mince" his words during the press conference in Washington. “Ours is not subsidy,” he stated. “Ours is a proper government equity in a company that is owned by the sovereign fund of my country. So what’s the problem?" The outspoken executive was also quoted as saying that "Richard Anderson (Delta chief executive - ed) is not a patriot of his country, because what he is doing is stifling the interest of the travelling public in the United States.” Al Baker added that he did not think the U.S. government would ultimately respond to the claims by its carriers, pointing to the bigger economic picture and the number of jobs created by aircraft orders from Gulf airlines. Meanwhile, Emirates' CEO Tim Clark has vowed to deliver a "sledgehammer" response to the report compiled by the three U.S. carriers accusing the Gulf airlines of receiving more than US$40 billion in unfair government subsidies. "Having read the report, you could drive a bulldozer through just about everything ... We will deal a sledgehammer to that report as far as Emirates and Dubai is concerned," Clark was quoted as saying at a recent conference in Dubai. Clark said the argument of stealing market share was weak as many of the destinations in the Middle East, Africa and Asia were minimally served by U.S. carriers. "We have never been subsidised. We have never received from the government of Dubai any kind of ... special treatment," Clark said in the Reuters report, adding that the airline's growth had been achieved without state intervention or state funding but instead came from its own cash flow, debt issuance and earnings. Analysts also note that under the Open Skies agreements, the three Gulf carriers plus express operators FedEx and UPS carry huge amounts of U.S. exports to various destinations in the Gulf area, while the U.S. airlines offer no significant capacity on those sectors. "If the U.S. government would agree with the demands of the US airlines and impose restrictions on these passenger and freighter flights, it would result in major implications for US exports and thus U.S. employment," one analyst pointed out. “It creates a slippery slope,” U.S. Travel Association President Roger Dow said. “This potentially could start a trade war of epic proportions,” and could encourage other countries to revisit their own open skies treaties with the U.S., which ultimately will harm the U.S. economy." In related development, data from the Centre of Asia Pacific Aviation (CAPA) and OAG, show that Chinese airlines have overtaken their US peers, with Air China, China Eastern, China Southern and Hainan Airlines to offer 2,028 weekly US-China flights in the third quarter peak (July 1, 2015 to September 30, 2015), which encompasses the peak northern summer travelling season. This compares to 1,853 flights from U.S. airlines. Chinese airlines will operate 9.4% more flights and 14.5% more seats than U.S. peers, according to the data. This may increase further as Hainan Airlines has announced a twice-weekly B787 Changsha-Los Angeles service that is excluded from this data. This change is a swing from 2011, when U.S. airlines had nearly double the amount of flights to China as Chinese airlines had to the U.S.
Will U.S.-China open skies be derailed? In a recent report, Sydney-based CAPA said that "although there are no public rumblings yet about derailing U.S.-China open skies, it is not difficult to see the American carriers take a similar view to Chinese carriers as to Gulf carriers: they have a geographical, network and cost advantage. They will be bigger than US carriers. The Chinese carriers, unlike their Gulf counterparts, have documented subsidies - and labelled as such - in their own accounts. "Unlike in the Gulf, the U.S. carriers need ample Chinese capacity, but not as much as Chinese carriers need U.S. capacity. The U.S. carriers will also need Chinese partnerships, meaning any effort to slow down the growth of Chinese carriers cannot be as brash as the U.S. airlines have been with their Gulf counterparts," the CAPA report concluded.